There are many reasons why business stationery is essential for most organisations. Now is the perfect time to review your business stationery requirements and see whether your could be getting more value for money. Your logo forms a key part of your visual identity and where appropriate all stationery that leaves your organisation should have your logo included on it. This helps to maintain consistency across communications and reinforce your brand. In addition to business details (i.e., address, web address and contact details), including other branding elements such as your company strapline will help to reinforce your brand values and support your brand marketing. Do it correctly and your identity will really stand out from the page. With your own personalised stationery, it is very easy for customers and colleagues to know that your correspondences are official. It gives any letters or documents a sense of authority and assures recipients that they are legitimately from your business. This is even more important if you are sending important documents such as invoices or account statements. These are just a few reasons why your business should consider its own personalised business stationery. There are many considerations with regard to materials, print and finish. With a range of different papers and finishes to choose from, your business stationery can be designed and produced exactly to your requirements. 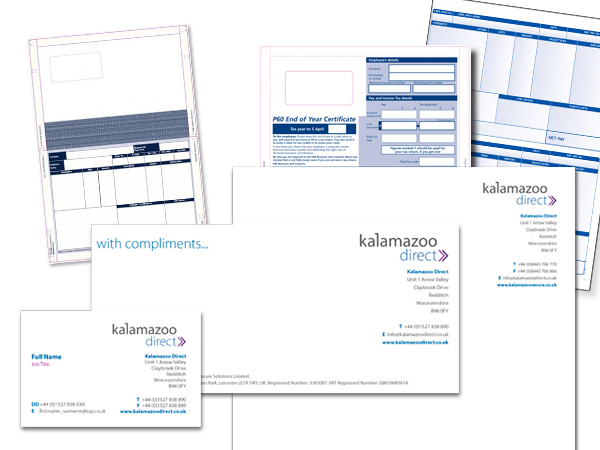 Kalamazoo Direct provides cost-effective, high quality business stationery to a wide range of local and national businesses. From business cards and letterheads to invoices and business cheques, we can provide a suite of professional looking business stationery that will help your business stand out from the crowd. If you need any assistance with the design or specification of your business stationery, please do not hesitate to contact us. Next story Why use a Visitor Book?